The Historic Titusville Courthouse halls of justice or injustice with Judge Moxley holding the reigns at the helm? 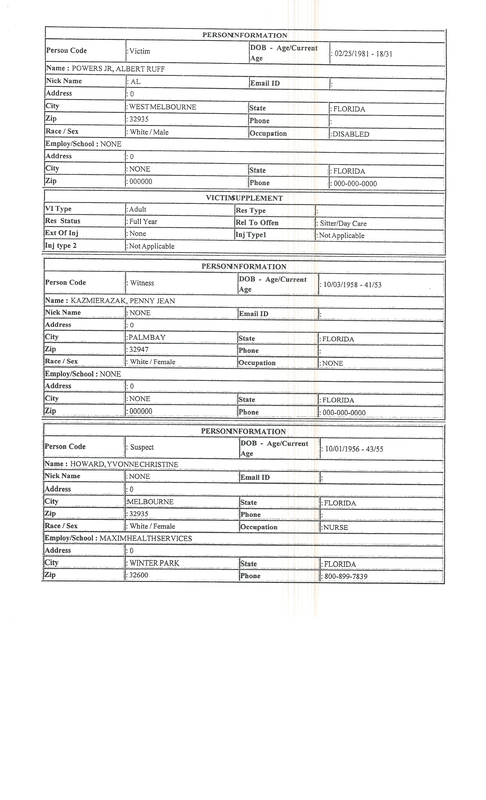 There appears to be a rogue element within the Brevard County judicial system and today, May 21, 2013, the Brevard County Sheriff Office was contacted for comments including Melbourne Police Chief Steve Mimbs. Although we are still awaiting a response new information has surfaced today. After repeated requests through Officer Fernez’s office to speak with Sheriff Wayne Ivey, on the current collusion in Brevard County that victimizes defenseless families, it is still unknown whether the sheriff has been informed of the nature of these crimes. 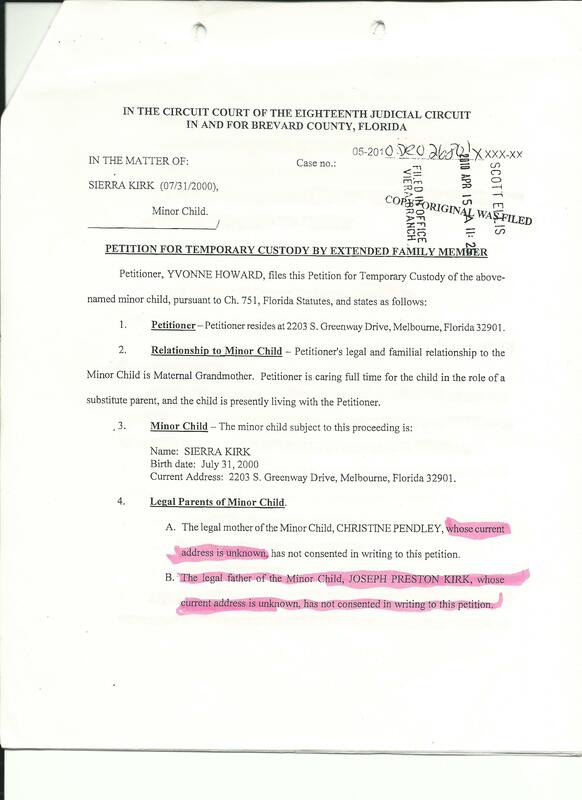 Yvonne Howard, Scarlett Davidson, Shari Jo Wilson, Joseph Culmer and Judge John Moxley appear to have total disregard for the safety of Brevard County’s children and the law. Judge John Dean Moxley Jr., previously in the news for the death of Mrs. Blanton, took the oath of office to uphold and defend all that is good and decent for the public good among a civilized society, the constitutions. However, it does not appear Moxley is good for his word or his judgement. Is Moxley purposely inciting chaos among the local citizens? Judge Moxley previously was a chief judge in Brevard County’s Eighteenth Judicial Circuit. Does Moxley think he is above the law? With a lust for greed and power abusing his position, is he testing the limits for how much he can get away with? Or has he relied on insiders to help him cover up crimes? Adoption scandals are at their peak and who will keep check on the security of the nations future, our families and youth, if the judicial system has gone astray of its core value? Brevard County Sheriff Wayne Ivey appears to be in support of the constitutions, as he pledged to defend the second amendment right. The question we all want to know is whether he will also defend families who have been clearly victimized by those individuals so named above. Sheriff Ivey’s background in law enforcement is inclusive of management, criminal investigations, narcotics, patrol services, public integrity investigations, and corrections. Sheriff Wayne Ivey, prior to being elected in 2012, served the citizens of the State of Florida as a resident agent in charge for the Florida Department of Law Enforcement. 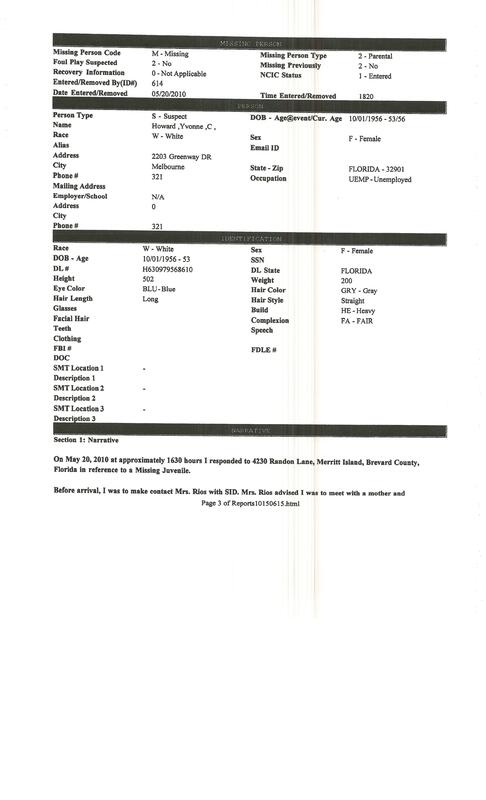 Which means, previous to his election, Ivey was a member of the Florida Department of Law Enforcement who ordered a missing child report be issued by the Brevard County Sheriff Department. 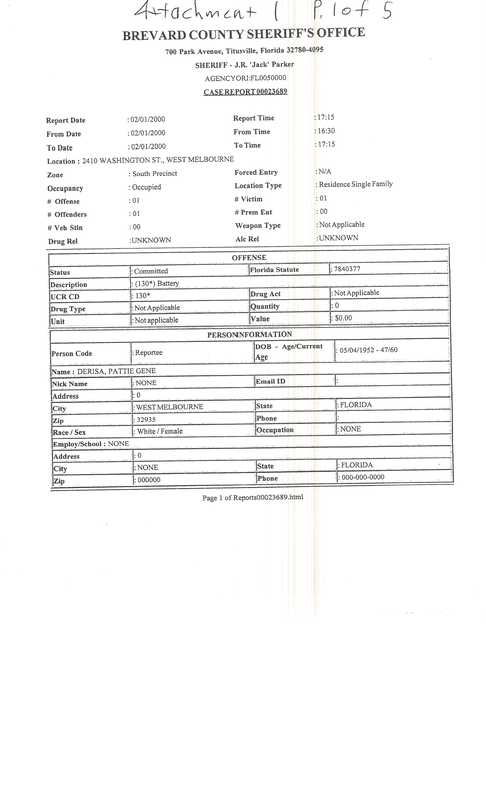 Under Jack Parker’s control at that time, the report was issued by the sheriff department due to Melbourne Police Officer’s and specifically Sgt. Shaffer refusing to exercise their duty as the official report states. 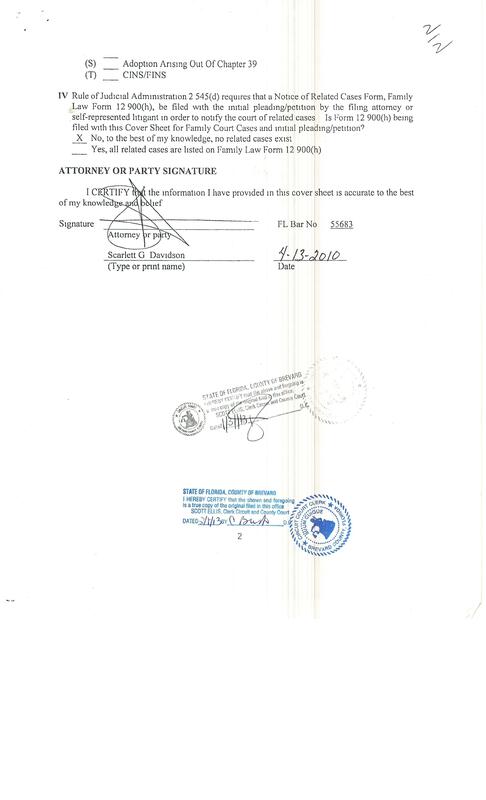 Above you can view a copy of what is filed with the Clerk of Courts, an incomplete unsigned document, that in its effect equates a non-legal document being incomplete was used to simulate legal process for the purposes of an illegal private adoption, which was the 3rd action filed, to circumvent numerous previous actions filed by the petitioner Yvonne Howard which is not even named on the above document to violate first, fifth and fourteenth amendment rights including due process. To restrict access to court and prevent the defense, parents, from testifying, presenting witnesses or providing evidence in defense of their family and child. What is its relevance? The related cases show the intent, as all crimes start with an intent. Just what was the intent? 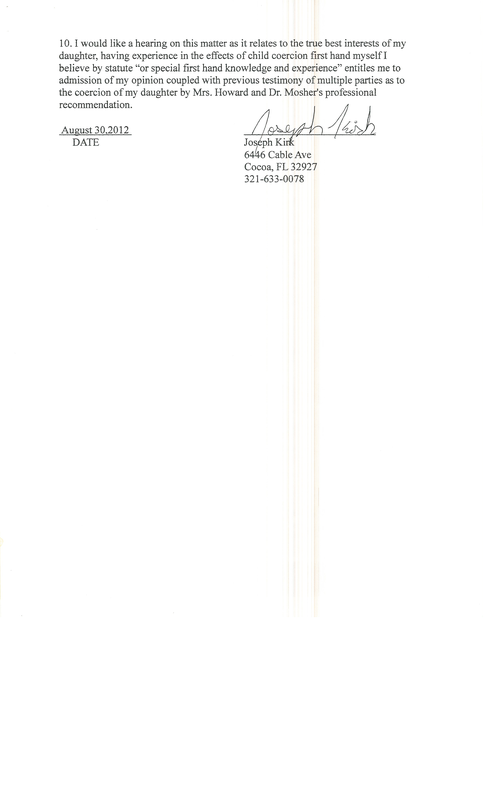 Chapter 63 is the adoption statutes for the State of Florida. 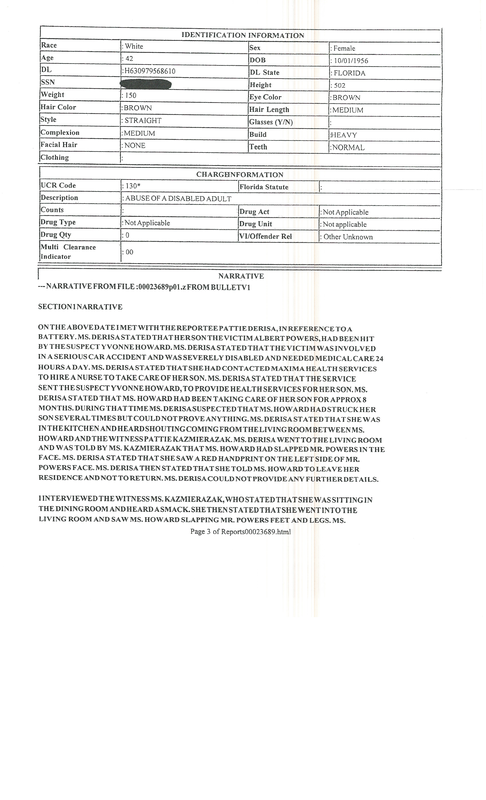 See below as case number 05-2010-DR-026801 was only the beginning of what appears to be vexatious and malicious litigation as shown above. The above was filed previously for the purposes of an illegal adoption and unknown to the parents right under their noses. How? No summons was ever filed for the father. 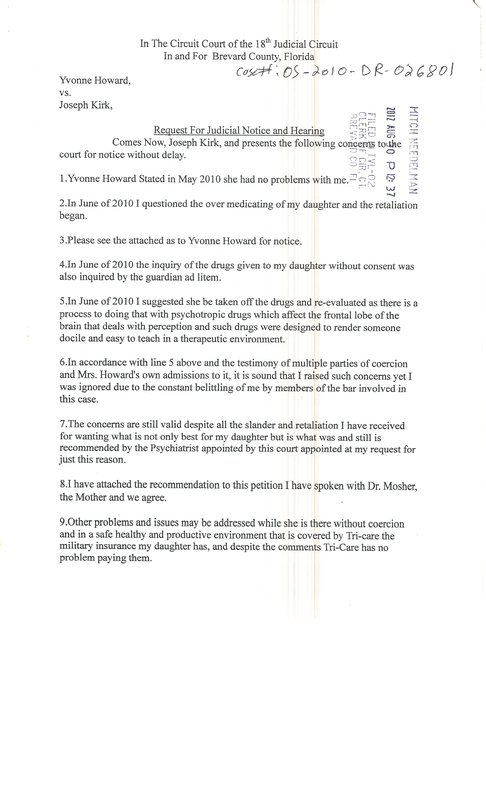 Although it would appear Yvonne Howard and Attorney Scarlett Davidson were issuing summons for the Mother in effort to appear as legal process, the fact remains clear, by her statement in her petition, that she had no intentions for that summons to ever reach the mother, Christine Pendley, living merely a few blocks away from Yvonne Howard. 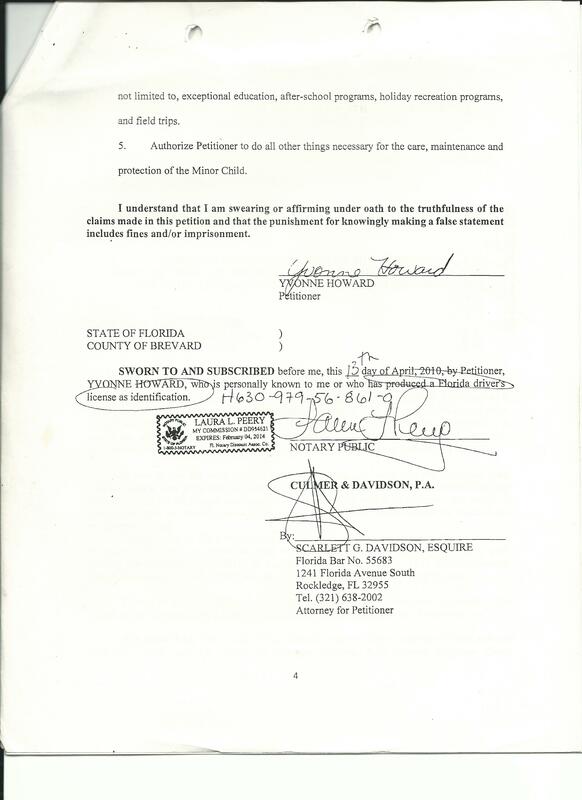 Yvonne Howard claimed she had no knowledge of where the parents were in her petition and summons despite the fact the mother lived a few blocks away with her ex-husband Bill Howard. Below you can see her statement was sworn under oath. Apparently perjury is the norm in Judge Moxley’s court room that appears to have become the home for black market child sales and illegal adoptions. These types of criminals statistically cut the child off from all family and friends. In cases like these it puts severe emotional stress on the child and in fact traumatizes the child. There is no worry in Judge Moxley’s courtroom where illegally dosing the child is OK.
Not only is illegally dosing the child OK but, defrauding medicaid to pay for it while the child is fully insured with military insurance appears to be good in Judge Moxley’s courtroom. Dr. Jeffrey Williamson who was paid cash and credit by Yvonne Howard, the kidnapper, testified to his displeasure with military insurance as he had problems being paid from them, of course not mentioning he has a report with the Florida department of Health for entering ‘bias’ reports in these types of cases. Why was Dr. Williamson testifying? Judge Crawford specifically ordered for Dr. Williamson not to do any counseling and to recommend someone else. Jeffrey Williamson testified he ‘chose to do it himself’. 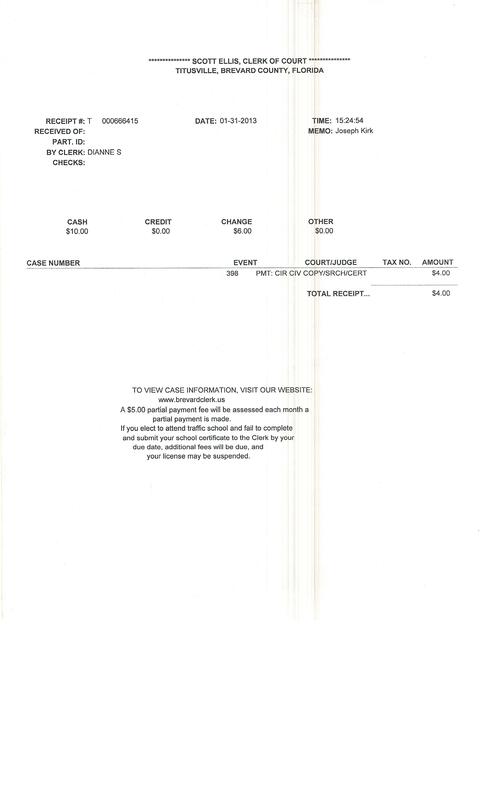 However, Judge Maxwell already found the kidnapper, Yvonne Howard, was paying him cash and credit. Why was he not held in contempt of court? Lets look at that again? No petitioner name? No related cases although it supposedly arrises from a related case? Previously Judge Moxley stated to the Orlando Sentinel he could not be all knowing in the law and that was his excuse for Allysa Blanton’s death. However, What is his excuse now? When he did know? 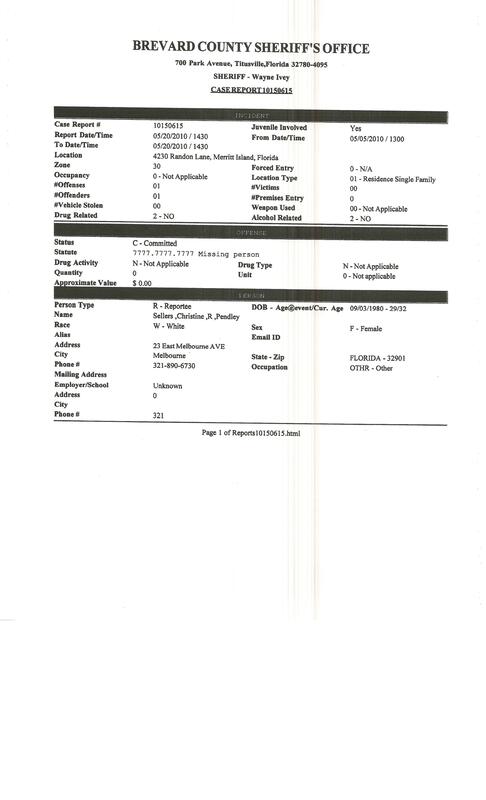 Above you see the certified copy of the cover sheet for purposes of an illegal adoption signed by Scarlett Davidson and below you will see Scarlett Davidson telling the Florida Bar it does not exist. The response below Judge Moxley stated on record ‘I’m not noticing anything from the Florida bar’, in a review for adoption purposes. 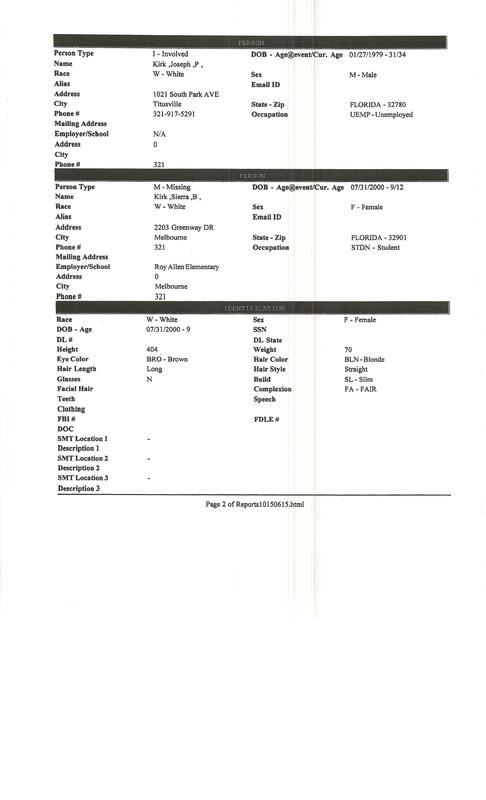 Let us point out 2 facts on the face of the document above. 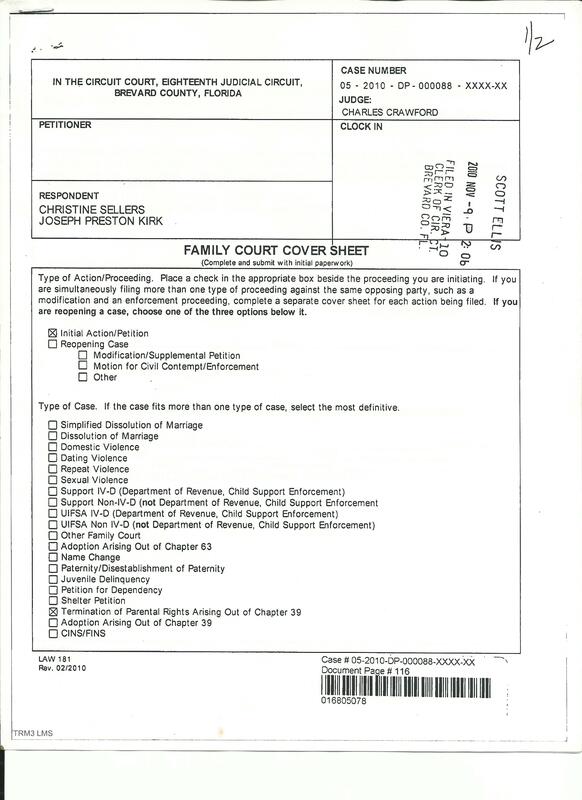 First, Scarlett Davidson claimed she only wanted temporary custody and no one was attempting to ‘adopt’ the child but, the cover sheet clearly shows it was for a chapter 63 adoption. This means she lied to the Florida bar. 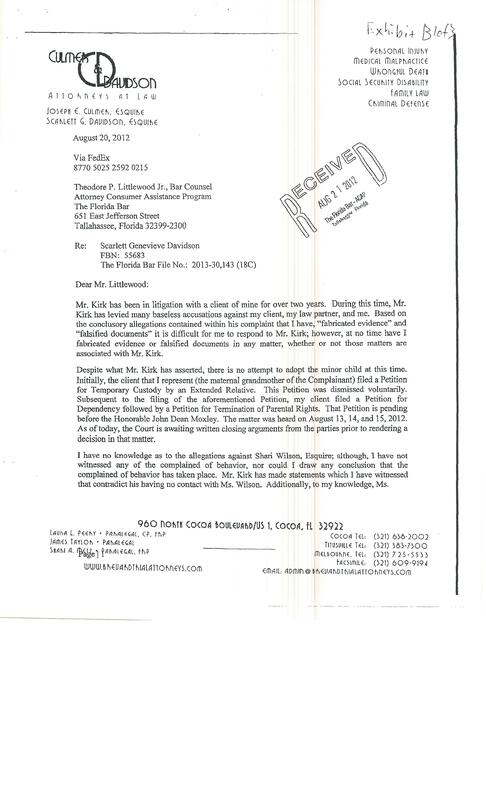 Second, Attorney Shari Wilson’s complaint was separate and this shows collusion. Let us again take a look at Judge Moxley as he claims he didnt have to hear this which was set 2 months prior due to him terminating parental rights. Apparently crimes are OK in Judge Moxley’s courtroom as victims have no redress if he terminates your parental rights which equates acts under color of law. Parental rights have nothing to do with people committing perjury and fabricating evidence. Furthermore, terminating parental rights have no effect on witness tampering and fraud. 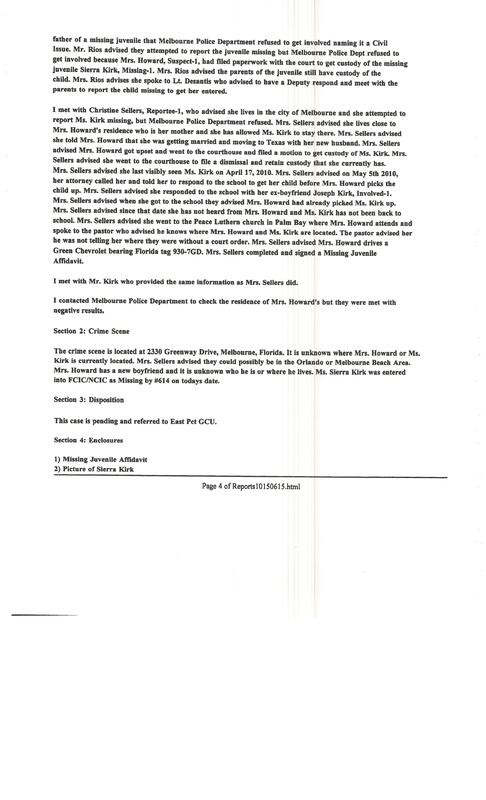 Below you can see the coverup attempted by a local Melbourne Police Officer was thwarted by the Florida Department of Law Enforcement. 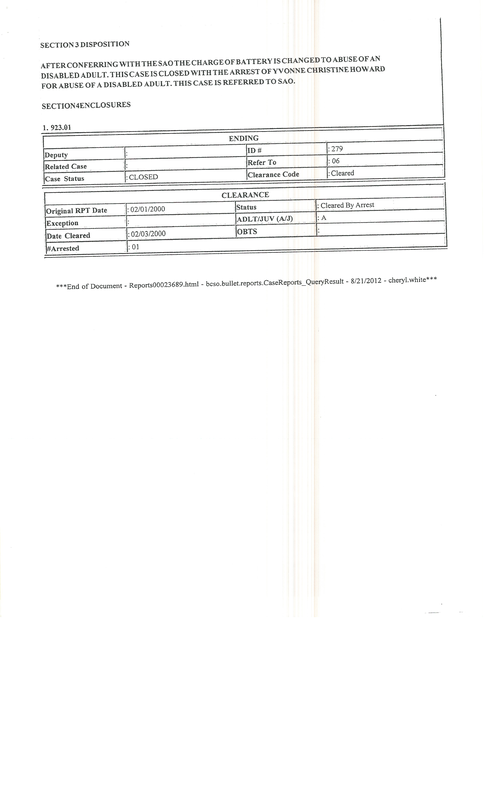 Due to the actions of Melbourne Police Department Officers a report wasnt placed until 2 weeks later. Apparently since, Major Walters stated there was no report to investigate and that he had no knowledge until now. However it was discovered officers not only took a report that stated facts already found as fact by a judge but they closed the case before sending it to be investigated. 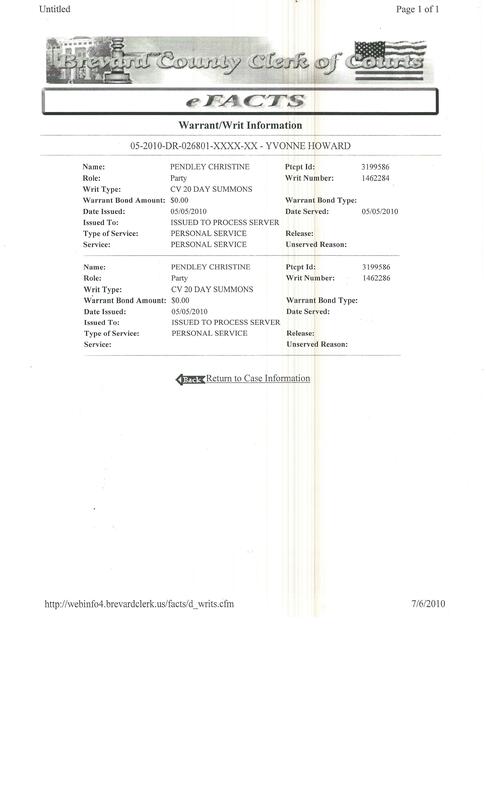 Who is agent Frank Ravenscroft and Corporal Craig Reynolds and why did Officer Tracey Morell seek to conceal the 18 page report in aid of Yvonne Howard and her attorneys? Governor Rick Scott signed SB 52 at Alonzo and Tracy Mourning Senior High School, banning the use of wireless communications devices while driving. The bill signed prohibits a person from manually typing or entering multiple letters, numbers, symbols or other characters into a wireless communications device. This includes text messaging, emailing and instant messaging through smart phones.